In September of 1969, the Lord spoke to me in a night vision that he was calling me to start a Bible school. At the time I was living in Sarasota, Florida with my family and had just begun a church in that area. We had been there only a short time when a missionary friend, Brother Jim LeBeau, visited our family. Shortly thereafter my wife and I received a thank you note in which my friend prophesied that the Lord would speak to me in two weeks and would tell me his will for us in Sarasota. At the time I was working as the supply man for a company that built condominiums and motels on the beach. That evening as I was preparing to retire, my wife Marge was reading a book by Kathryn Kuhlman entitled I Believe in Miracles and asked if I would like for her to read to me. As she read, the Spirit of the Lord came upon me and I began to travail in the spirit. This visitation of God's spirit was upon me for two weeks and then I received a vision. The Lord said to me, "I did not call you here to gather a church people together but I called you here for these" and in the vision I saw a group of young people dressed like hippies. The Lord told me to count how many people there were and I replied, Forty-two. The Lord said that in one year from that night I would meet these forty-two young people and that he had sent me to minister to them. Exactly one year later I attended a businessman's meeting at which a brother by the name of Ed Mauer, who had been witnessing on the streets of Sarasota, asked if the forty-two young people who had given their lives to the Lord would stand up. These were the same young people I had seen in the vision one year before. At the Lord's direction, their leaders. Brother and Sister Fitzgerald, who had been gloriously saved, asked if I would consent to be their teacher. This was a confirmation of the word I received from the Lord in the night vision one year before. In the second part of the vision the Lord spoke to me to open a Bible school and said that because He had told me to open it, He would bless it, and He would send young people. When they were ready to depart, He would witness to my heart and to their hearts and send them into the field. It was eleven years before God brought this part of the vision to pass and during that time not another word was received concerning it. We tried to open this school in Sarasota but the door did not open. Eleven years later I petitioned the Lord to speak to me concerning the fulfillment of this part of the vision or to take the burden from me. I said, "Lord, I believe that you have overlooked me. I have waited eleven years and haven't heard another word." When God first spoke to me, I felt I was too old to begin a Bible school and eleven years later, at the age of sixty, my feelings had not changed. We eventually moved to Rocky Mount, Virginia. While preaching in a church pastored by a good friend, a prophetess, Linda Patterson, spoke a prophetic word over me as the church service was about to begin. The Lord said, "I have not overlooked you." No one knew that I had said this to the Lord except myself. the Lord said, "You will open this Bible school. It will be called the School of the Prophets. The building will have seven windows across the front which represents the seven spirits of God" and she described the shape and size of the windows. She said there would be a stone fireplace at the west end of the building and many other windows in the building. She said in thirty days we would have exactly $30,000 to start the first building. Thirty days from this prophecy I had been given exactly $30,000. When the plans came back, without having said anything to the architect about the number or size of the windows or about the stone fireplace, the building plans were drawn exactly as prophesied. This was the beginning of miracles. The School of the Prophets opened its doors in September of 1985 to thirty full-time Bible school students and has had the privilege of training and sending many students out into the harvest field. The vision, which was born in the heart of God, continues to grow. My son, Philip Crandall, along with his wife, Gina, have been a very important part of this work from the beginning. Brother Phil was in Sarasota, Florida, newly married, when a prophet of God called me on the phone and said, "You will be receiving a call from your son, Philip, telling you that he and his wife will be moving to Rocky Mount, Virginia within three weeks to become a part of this vision." I received that telephone call from my son just as the prophet said. Brother Phil was in charge of the building program and worked faithfully without any salary from the church for over ten years. In 1991 the Lord spoke through a number of his prophets that the time had come for Brother Phil to assume the responsibility of carrying the vision forward. 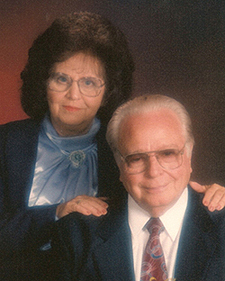 Brother Phil became the President of the School of the Prophets and Pastor of Blue Ridge Gospel Tabernacle. God has blessed Pastor Phil and Sister Gina and their family, along with many others that are working with them. God has allowed my wife and I to plant many churches through the years, but the Bible school in Rocky Mount has been a blessing in our lives. We trust that you will have the opportunity to experience the moving of the Lord's Spirit in Rocky Mount.